Exuding Art Deco glamour, hand-decorated glass ornaments in platinum, silver and champagne lend refinement to blue-gray hues in the Mixed Metals Greenery Collection. 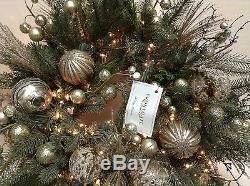 Lifelike blue spruce and white spruce blend glamorously with glittered cedar and pine. Wreath has clear LED lights. Pre-lit items have clear incandescent lights and 6 ft. 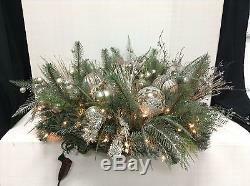 Realistic Colorado blue spruce, white spruce and cedar accented with glittered cedar and glitter-veined feathered pine. Indoor or protected outdoor use. Some shaping required after unpacking to achieve maximum fullnes. 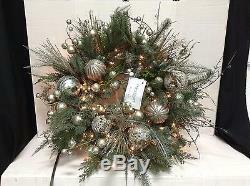 32" Predecorated Wreath (152844): 200 lights, 13"D, 9 lbs. 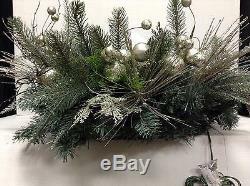 See my store for more Christmas items! 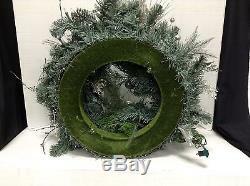 The item "Frontgate Christmas Holiday Centerpiece Table Mixed Metals Glam Wreath 32" is in sale since Wednesday, January 11, 2017.